GTViewer version 9.0.x.6 is available. - FIX - #6170 - Raster range computation for MrSID file would have problem with large images using lat/long projections because of roundoff error. - FIX - #6171 - Problem introduced with #6166 where the application menu does not clear out the default entries when no query or app menus exists. GTViewer version 9.0.x.5 is available. - FIX - #6165 - Maximum Priority count was not initialized for dataset that did not use style rules. - FIX - #6166 - Application menu would not update in some cases such as when a document was opened then closed, then another document was opened. GTViewer version 9.0.x.4 is available. - FIX - #6121 - On Break at Vertex would be enabled and would work when on the first or last point of a line string. - NEW - #6123 - LogRedlineEdits has been added to the [Additional Properties] section. If set to 1, all Move, Rotates, and Scales will be logged to a file. - FIX - #6128 - Disclaimer would hide GTViewer when opening a file wit the Open Last File option on. - FIX - #6130 - Category Level Display and Print Thresholds for Style, Weight, and Priority were not working correctly. If defined and false, they were using the default setting for the dataset instead of an off value. - NEW - #6133 - GetPrintProperty and SetPrintProperty methods have been added. - FIX - #6141 - Force Black and White was not converting colors for elements using a style rule with a BorderColorValue specified. - NEW - #6144 - GetElementText will now work with Dimension Elements. - NEW - #6146 - GetElementFontId will now work with Dimension Elements. - NEW - #6148 - GetElementTextSize will now work with Dimension Elements. - NEW - #6150 - GetElementDimensionInfo method added. - NEW - #6151 - DrawDimension32 method added. - FIX - #6154 - The X prompt will now have the focus when the dialog displays. - FIX - #6155 - The ExportSessionGraphics method was not properly handling the mode parameter. - FIX - #6156 - Problem was introduced with #5880 where the active indicator is shown by an active user preset. GTech Loader version 8.0.0.15 is available. - FIX - #6129 - If a Legend entry did not have a default style rule defined, the loader would stop. Now, the last style rule in the list will be used as a default, and a message is written to the log file. - FIX - #6134 - Elements whose ESEQ value did not reset between elements were incorrectly grouped together. GTData version 9.0.0.1 is available. - FIX - #5990 - GTQuery - GTQuery was not displaying the version number in the output header. - NEW - #6008 - GTRemapFont - GTRemapFont utility added to remap fonts by number in a .gtg file. - NEW - #6086 - GTCompact - All deleted elements are not omitted. - NEW - #6094 - GTLabelGtg - The LabelAttribute entry can now be set to "\n" to allow carriage returns to be placed between attributes. - FIX - #6122 - GTIndex - The TrueType font list was not show when the application ran. - NEW - #6124 - Support for Redline Edit Logfiles with the -editFile parameter. - CHG - #6125 - InstallShield Setup change to allow upgrade if installing a newer version instead of requiring the previous version to be removed. Version 8.0.x.12 of GTVx is available. - NEW - #5904 - The GetFilterIdFromGisInfo method has been added to return a list of Filter ids from a GIS Feature and GIS Component information stored in the Filter Description field. - NEW - #5905 - GetGisInfoFromFilterId method has been added. - FIX - #5925 - The first record in the sorted index (.idx) would not be returned when multiple records with the same keys were found. - CHG - #5934 - UpdateElementSetText will now pad the new text element with spaces instead of nul characters if the new text string is shorter than the existing one. - NEW - #5944 - The BGMaskAddShapeFromBuffer method was added. - NEW - #5957 - New BGMask functionality added: BGMaskAddShapeFromBufferEx, BGMaskDeleteByKey, BGMaskGetList, BGMaskGetRange, BGMaskClearHighlight, BGMaskSetHighlight, BGMaskGetElementInfo, BGMaskAddCircleEx, BGMaskChangeColor, BGMaskMoveToBack, BGMaskMoveToFront. - NEW - #5958 - Session Data Info support added. New Methods: AddSessionDataInfo, ClearSessionDataInfo, RemoveSessionDataInfo, GetSessionDataInfo. - FIX - #5960 - Ascii Representation of Embedded data did not handle Pipes in the data. - NEW - #5977 - ElementGetPartList method has been added. - CHG - #6006 - More font sizes were added to the Text Size combo in the Place Text Dialog. - NEW - #6007 - CustomPrint functionality has been added. New methods: CustomPrint, CustomPrintAddInstruction, CustomPrintClearInstructions. - NEW - #6038 - UniqueListAdd, UniqueListCheck, UniqueListClear, UniqueListGetListOfSame methods have been added. - NEW - #6039 - Data Property FeatureCountHighlight added to enable (1) or disable (0) the Feature Count Highlighting. The default is to highlight. - NEW - #6091 - The CountFeatureDetail method will now process each element in a group separately if the group does not test as a closed shape. - NEW - #6092 - Fill Style now supported in Style Definitions. - NEW - #6096 - The FindIntersection method has been added. - NEW - #6103 - RequestNewBreakElementKeys event is fired if breaking an element at a vertex will create a new element (breaking a linestring). - FIX - #6104 - On Break at Vertex would be enabled and would work when the required number of point in the element were not met. - FIX - #6109 - Add, Delete, and Break at Vertex were causing the ElementSelected event to be fired too many times as the old element was deleted and the new element was added. - CHG - #6119 - Changes to the InstallShield setup, so that a previous version will automatically be removed when installing a new version. The installation no longer needs to be run twice when upgrading. GTViewer version 9.0.x.3 is available. The Release Candidate and Released version held up the normal flow of updates for the last month. We will now resume our normal schedule. - FIX - #6110 - Add, Delete, and Break at Vertex were causing the ElementSelected event to be fired too many times as the old element was deleted and the new element was added. - FIX - #6111 - Attribute Info dialog now uses a default width that includes the Count button. - NEW - #6112 - Count Detail dialog will now show coordinate values in Lat/Long if one of the Lat/Long coordinate readout modes is used. - CHG - #6113 - Tip of the Day no longer shown at startup. - FIX - #6117 - Hatch Fill on Shape with Hole elements would not use the correct fill color. - FIX - #6118 - Print to Scale with Center of View was not getting all of the graphics in the print (it was still using center point as the lower left corner of the spatial query). GTViewer 9.0 has been Released! GTViewer 9.0 has been released. Favorites - Create and return to favorite locations. Applications Menu Item - place External Applications under the Query menu or the new Applications menu. Location History Dialog Enhancements - Query entries now include prompt values; history list can be filtered to show only Query entries. ToolBoxes - Define up to 10 ToolBoxes whose buttons can perform queries, activate presets, toggle the display of feature sets, run external applications, and more. Locate XY Dialog Enhancements - User can select between X/Y and Lat/Long modes; Last 10 locates are now stored in a history list. Attribute Info Dialog Enhancements - Print attribute info; Jump to Style Manager; Copy individual values to clipboard. Custom Print Labels - Provide up to 10 custom label prompts to add custom information to prints. Hatch Fill Styles - 6 new hatch fill styles are now supported. Custom Attribute Info Tabs - Create a new tab by combining attributes values from other tabs. Command-Line Parameter Enhancements - Specify X/Y or Lat/Long to locate; Set Display Preset. GPS Reference Point - Place a reference point and the GPS indicator will always point in its direction. Query Results Dialog Enhancements - Get Attribute Info for selected record; Set GPS reference point on Located feature. Dynamic Highlighting Support - API provided for highlighting features based on attribute values. API - 38 new methods and events added. The Release Candidate for GTViewer version 9.0 is available. Current GTViewer users can get the release candidate by contacting support@gti-us.com. GTViewer version 8.0.x.54 is available. - FIX - #5998 - Editing a Redline Text element where the font was not specified would cause problems. - CHG - #6005 - More font sizes were added to the Text Size combo in the Place Text Dialog. - NEW - #6022 - The command-line now supports the -top flag to send GTViewer to the top window position after the command-line is executed. - FIX - #5995 - GetGisInfoFromFilterId method was not returning the right values. GTech Loader version 8.0.0.14 is available. - FIX - #5980 - Point buffer increased from 30000 to 50000. If a point list is greater than 50000, it will now truncate overflow points and log message. GTViewer version 8.0.1.52 is available. - NEW - #5978 - ElementGetPartList method has been added. - FIX - #5989 - Renaming a Style Definition would not rename the styles used by existing mappings in the Style Manager. - NEW - #5972 - The ability to recognize if the filter or category settings have changed from what is stored as the current view in the session file has been added. Differences are now logged. - FIX - #5973 - Change to the Toolbox display so that when GTViewer is started up, the delay in updating the toolboxes is greatly reduced and does not leave the empty toolbox while it refreshes the view for the first time. The PGTViewer .NET Control for Window Mobile version 8.0.0.6 is available. - FIX - #5846 - OpenFile will now return false if scale parameter is not -1 and less than or equal to 0. - FIX - #5851 - CaptureModeId is not reset to 0 after mode mode change from Capture mode. - FIX - #5854 - PanSteps property was not being property used to step the panned view. - FIX - #5855 - Raster property was not being set to false after CloseFile. - FIX - #5896 - Text using an extended style color would not de-color when using the Emphasize Session Graphics mode. - FIX - #5927 - The first record in the sorted index (.idx) would not be returned then multiple records with the same keys were found. - NEW - #5983 - The FillOffForRaster entry has been added to the Additional Properties section so that element fill will automatically be turned off when raster is shown. The latest version of GTData (version 8.0.0.4) contains four new utilities. If we count the recently released version 8.0.0.3, we can add a 5th new utility. There are now some 55 different utilities provided with GTData. The latest additions may not be of immediate use to many of you, but I want to use this post to run through what they do. After all, knowing what tools you have may be as useful as having the tool in the first place. GTRemoveAttr – this utility will take a GTViewer tabular data file (data.txt) and a list of table/attribute pairs and produce a new tabular data file with the specified attribute values obscured (replaced with asterisks). Some customers have asked for this functionality to simply the process of building alternate GTViewer datasets to give to contractor or other entities outside their company. While you may say, that you could just create an alternate .GTM file that specifies a data.tab with the attributes hidden, you would be right, but the GTRemoveAttr utility will physically remove the sensitive data out of the data.txt file making it the safest way to distribute the data (other than loading the data without the sensitive data in the first place). GTPreset – this utility solves the difficult problem of keeping your Display Preset definitions (.gtp) in sync with changing data. With Style Definition based datasets like G/Tech, ESRI, Smallword, and any GTViewer data produced by FME, the continual addition of new Filter Ids as new style or features show up make it challenging to keep the Display Presets up-to-date. After all, the .GTP files have been created by taking a snapshot of the current display settings and exporting them to a file. The GTPreset utility takes a .GTM file and a Display Definition File and produces a new .GTP file on demand. This step can be added to the conversion process and will always keep the Display Presets current with the data. How this works is that the Display Definition file describes the state of the display settings for the Preset in a different way than with just Category and Filter ids, so that the more abstract description can be used to generate the preset instead of the snapshot of view settings. 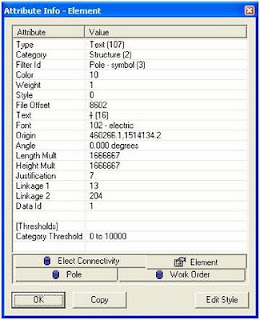 The Display Definition File uses the same notation as the Display Toggle Definition recently added to GTViewer's ToolBox functionality, so they can easily describe what you want the preset to be using GIS Feature/Component Numbers to set a feature on or off, or using more general concepts like everything in a particular category is set on or off. This approach was added to GTQuery a couple of years ago to solve this same problem when building queries that were dependent on a changing set of Filter ids. Now, the Presets can use the same technique to always stay in sync with the data. GTGtx2Gtg – this utility allows you to perform a common task in GTViewer on the command-line (or in a script). Instead of opening up an Extract file (.gtx) in GTViewer, selecting Draw/Export/Export Graphics and specifying a file to create (.gtg), you can now use GTGtx2Gtg and specify a .gtx file as input and a .gtg file as output. The session category is then exported out as a new .gtg file. This process can be scripted and can easily process large numbers of .gtx files if necessary. GTOrcl2Mdb – this utility creates an Access file (.mdb) from a SQL statement and an Oracle connection. There are certainly other ways to perform this task, but this utility provides a means of doing it quickly and easily and in-line with the other GTData utilities. Why would you need to use this process with GTViewer? There turns out to be a couple of problems already that it can solve. With the G/Tech Loader, it turns out that there is often data that is outside the reaches of the Oracle server hosting the G/Tech data such as Customer Information Records, Inspection records, etc. This tool actually uses an OLEDB connection, so it theoretically can pull data from OLEDB data sources other than Oracle, but it was originally intended to be used in conjunction with Oracle. The G/Tech Loader allows an Exported Table to be specified as a Join between a SQL query made to the G/Tech data and a SQL Query made to the Access file. A common key must be present to link the two together, but the end result is just another table the GTViewer data with attributes from both the G/Tech Data and the data in the .MDB file. The second use for this utility is to build an Access file for use with a GTViewer External Application. It is sometime easier to build an app using pure OLEDB in .NET to find application specific data, rather than going through GTViewer's query mechanisms. The Access file can also support multiple indexes, it can contain data from different sources other than the G/Tech database, etc. GtOrcl2Txt – this utility is very similar to the GTOrcl2Mdb utility except that instead of creating a .MDB file, it outputs the query results to a text file. There are many uses for this utility too, but the primary reason for its creation was to create unique value list files for GTViewer External Applications. For example, if you want a list of unique circuit ids used in your data, this utility can easily make a .txt file that lists these values. The utility's scriptability makes an easy way to keep such lists up-to-date with the data. GTData version 8.0.0.4 is available. - CHG - #5907 - GTMergeGtg - All deleted elements are now filtered from the output file. - CHG - #5909 - GTGetKeys - All Deleted elements are now ignored. - NEW - #5923 - GTOrcl2Mdb - New Utility added for convert Oracle SQL statements to an Access (.mdb) file. - NEW - #5931 - GTRemoveAttr - New Utility added to obscure attribute values in a tabular data file. - NEW - #5948 - GTOrcl2Txt - The GTOrcl2Txt utilty has been added to GTData to save a SQL query to a text file. - NEW - #5954 - GTFilterImp - The -fea flag has been added to allow filter settings to be imported based on GIS information (Fea/Comp). - NEW - #5966 - GTQuery - FilterOmitString entry added to defintiion file to omit filter names that contain the specified string. - NEW - #5967 - GTGtx2Gtg - New Utility added to export the Session from a .GTX file to a .GTG file. - NEW - #5974 - GTPreset - Converts a Display Definition file into a Preset file (.gtp). The GTViewer .NET Control for Windows version 8.0.0.25 is Available. the Emphasize Session Graphics mode. when multiple records with the same keys were found. less than or equal to 0. - FIX - #5852 - PanSteps property was not being property used to step the panned view. - FIX - #5853 - Raster property was not being set to false after CloseFile or DetachView. - FIX - #5856 - MeasureFactor was not being applied to distances not using the LatLongFlag=1. - FIX - #5857 - MeasureFactor now defaults to 1.0. - FIX - #5858 - Extended Style was not being correctly stored on session element with the CurrentExtendedStyle property. absorbed instead of returning an invalid session file. - FIX - #5795 - Reading .GTS files where element with no embedded followed elements with embedded data, the element with no embedded data would get a copy of the previous element's embedded data. - FIX - #5780 - DeleteSelected method did not work. - FIX - #5764 - Emphasize Mode did not work for Printing. GTViewer version 8.0.1.50 is available. - NEW - #5961 - The New Session dialog now supports 15 items in its history (instead of 10), and a Clear button has been added to clear out the file history. - NEW - #5962 - New Command-Line flags added: -Loc, -Preset, -Raster, -Emph, -Track. - FIX - #5963 - If the Open Last file option is on, the command-line file parameter would get ignored. - NEW - #5964 - ToolBox Actions have been added for KeepGpsIndicatorInViewOn and KeepGpsIndicatorInViewOff. - NEW - #5965 - Session Data Info support added. New Methods: AddSessionDataInfo, ClearSessionDataInfo, RemoveSessionDataInfo, GetSessionDataInfo. - FIX - #5968 - Default Toolbox position was not correct. Version 1.0.0.30 of the GT/Metadata Explorer is available. - NEW - #5911 - Export tab added to export Metadata to CSV and MDB formats. - NEW - #5921 - Feature/Component Used By Tab added to the Style Tab. - NEW - #5922 - Paper Scale added to Legend List on Feature to Style tab. - FIX - #5930 - Expression Parameter list with String containing comma would not be correctly parsed. - NEW - #5933 - Support for LIKE in the Style Rule Expressions. - CHG - #5943 - Equal and Not Equal Expression Operators in style rule expressions will now let integer and string types be directly compared without a type mismatch error. Integer are converted to string and the comparision is done with string values. - NEW - #5867 - Upgraded Graph Layout components. Pocket GTViewer version 8.0.x.4 is available. - CHG - #5906 - The SSF Capture Point mode now provides a Clear softbutton to reset the captured points. The SSF Point capture mode will capture SSF Points until the Finish button is pressed. - FIX - #5819 - Dimension Elements (Type 112) in the Session Category are now absorbed instead of returning an invalid session file. - FIX - #5843 - The SSF Writer Option Log Carrier was not persistent from one view of the dialog to the next or one session to the next. - FIX - #5748 - AddSelectedElement did not work with Mode 100. - FIX - #5158 - Adjustments to Style Manager to prevent style gaps at boundary threshold values. - NEW - #5549 - New Logos. GTViewer version 8.0.x.49 is available. - NEW - #5910 - The Attribute Info dialog now supports a Ctrl-P to print the active tab. A Print button has also been added to the dialog. - NEW - #5912 - ToolBoxes 6 through 10 have been added. - NEW - #5913 - ActivateZoomMode, ActivateInfoMode, ActivatePanMode, FitData, FitSessionGraphics, ActivateDisplayFilter, ActivateOverviewMode, ActivateMagnifyMode, ActivateMeasureMode, ActivateGpsDialog, ToggleKeepGpsIndicatorInView, and GotoPreviousView commands have been added to the ToolBox Command Action. - CHG - #5914 - Toolboxes now use Blue for Display related states and Orange for Modes. - FIX - #5915 - Toolboxes did not initialize the button state color when turned on from the Tools menu. - NEW - #5916 - Button Height can now be defined for ToolBox buttons. - NEW - #5917 - UseDescriptionForLinkMenuItems option added to Additional Properties section to allow the description of the Link to be displayed on the Right Mouse menu instead of the filename. - NEW - #5918 - ActivateGpsReferencePointDialog, ClearGpsReferencePoint, ActivateGpsReferencePointPlacement. - NEW - #5919 - AutoGpsRefPointMode entry has been added to Additional Properties section of the .GTM file. 0 is default, 1 is always use ref point on locate, and 2 is never use ref point on locate. - FIX - #5924 - The first record in the sorted index (.idx) would not be returned when multiple records with the same keys were found. - CHG - #5935 - UpdateElementSetText will now pad the new text element with spaces instead of nul characters if the new text string is shorter than the existing one. - NEW - #5953 - PostCloseMessage entries are now supported in the General Info section to allow a message to be displayed when a document is closed. - NEW - #5901 - Post Copy action will create the output directory if it doesn't exists. GTData version 8.0.0.3 is available. - NEW - #5595 - GTRefSort - The -dump flag has been aded to dump the contents of a .ref or .fer file. - NEW - #5609 - GTStyleMgr - The -clean, -c, -co, and -cf options have been added to allow a filter list of style definition headers to be listed with predefined content. - NEW - #5628 - GTQuery - Type 53 added so that a prompt list is created without the overhead checking for unique values. - FIX - #5737 - GTFontEdit - Import DGN functionality was not handling elements well if they contained negative coordinates. - NEW - #5804 - GTCompact - A new flag (-DropGroup) has been added to drop all groups leaving the group's sub-elements as independent elements. Linkages are preserved, and embedded data is dropped. - NEW - #5902 - GTMergeGtg - The -tag and -tagAll options have been added to embed the source file's filename on each element. - NEW - #5903 - GTRemoveTag - GTRemoveTag has been added to GTData. - NEW - #5420 - GT2Shape - Export to Shape will allow any embedded record to be selected. - CHG - #5421 - GT2Shape - Will now convert GT/Field Table.Attribute names to just the Attribute name when the table is the same as the attribute prefix. Export Data and Export to Shapefile are affected by this change. - FIX - #5422 - GT2Shape - GTField encoded string are now displayed and exported correctly. - NEW - #5424 - GT2CSV - The GT2CSV utility has been added to GTData. - NEW - #5434 - GTCompact - New options have been added: -removeKeys flag to strip all linkages from a .gtg file, -removeData to strip all embedded data, and -removeAll to strip both keys and embedded data. - NEW - #5440 - GTGetRecords - AdditionalValue entry added. - NEW - #5441 - GTQuery - PromptDefaultComparisonType added for each prompt entry. - NEW - #5464 - GTQuery - The QueryDisplayPreset entry can now be specified. - FIX - #5468 - GT2Shape - Export to shapefile was reading elements with an embedded style as an element with embedded data. - FIX - #5469 - GT2Shape - Export to shapefile did not export group elements if they did not have embedded data. - FIX - #5471 - GT2Shape - Export to shapefile did not export element without embedded data (problem introduced with 5417). - NEW - #5136 - GTLabelGtg - OmitAttributeValue and RequiredAttributeValue are now supported. - FIX - #5247 - GTExtract - BackgroundColor entry in .gtm file was not recognized. - FIX - #5248 - GTPack - BackgroundColor entry in .gtm file was not recognized. - NEW - #5369 - GTLabelGtg - Mode 6 added to provide fixed size text at line mid-point. GTViewer version 8.0.x.47 is available. - NEW - #5892 - The GTFieldPostGtgMode entry was added to allow all session graphics to export or just session graphics with embedded data. - FIX - #5893 - Text using an extended style color would not de-color when using the Emphasize Session Graphics mode. - NEW - #5899 - The GTFieldPostActionProcessingMode entry has been added to process all actions (default) or to process actions until success. - NEW - #5900 - Post Copy Actions can now specify a description that will be shown in the log and Status bar. - NEW - #5888 - Right Mouse menu now shows all of the details instead of just the first one. - NEW - #5889 - AlwayMaximize setting added to the registry settings to maximize the application regardless of the session settings. - CHG - #5890 - The Right Mouse menu will no longer show file based details if the file does not exists. - FIX - #5891 - The 5th ToolBox entry action was not being recognized. - NEW - #5887 - Display ToolBoxes now support a Command for HideShowRasterOn, HideShowRasterOff, EmphasizeSessionGraphicsOn, and EmphasizeSessionGraphicsOff. - NEW - #5879 - DefaultGpsReceiverType has been added to the GpsInfo.ini file. - NEW - #5880 - Display Preset tab now show an asteristk by any preset that is currently active. - NEW - #5881 - Display Preset Toolbox Button will now indicate that a preset is active by changing the color. - FIX - #5882 - ToolBox Presets and Display Toggles were not marking that session as being modified, so if they were the only change, the session was not updated. - NEW - #5883 - Display Toolbox will now indicate a Display Toggle, DispOn, or DispOff button is active by changing the button color. - CHG - #5884 - Display Toggles will now turn on the specified display if any part is turned off. - NEW - #5885 - Display Strings now support a Dft() to use the default filter id for category. - NEW - #5886 - Display Toolbox will now indicate when a Command:EmphasizeSessionGraphics, Command:HideShowRaster, or BGCol is active by changing the toolbox button color. - NEW - #5849 - GetStyleOrigin method will now support mode 1 to return Computed coordinate values. - NEW - #5861 - Exclude entry has been added to the ExportDgn configuration file to specify a list of features or category to exclude from the print. - NEW - #5862 - IgnoreThresholds entry has been added ot the ExportDgn Configuration file to specify if the display threshold apply to a specific category. - FIX - #5863 - The DefaultGPSReceiver entry was getting corrupted if the Gps Receiver dialog box were activated. - FIX - #5864 - The Item string for ToolBox DispTog, DispOn, and Disp off was not removing the whitespace around GIS entries making it miss matches where whitespace was found in the entry. - NEW - #5865 - The MinExportZoomLevel and MaxExportZoomLevel entries have been added to the ExportDgn.ini file to prevent an export from occurring outside a specified zoom level range. - FIX - #5841 - DispOn and DispOff did not work correctly. 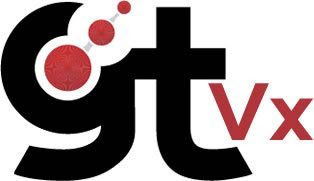 Version 8.0.x.11 of GTVx is available. - FIX - #5811 - The LoadStyleDef method did not regenerate the style mappings pointers to the style unless LoadStyleMap was used too. - NEW - #5830 - The Style Origin defined in Standard Fonts for Text Element symbols was not used in Rotation and Scaling operations. - FIX - #5842 - Clipping Problems with Shape with Hole element have been fixed. Probably only seen when printing large Shape with hole elements that are filled and mostly out of the view. - NEW - #5848 - GetStyleOrigin method will now support mode 1 to return Computed coordinate values. - FIX - #5894 - Text using an extended style color would not de-color when using the Emphasize Session Graphics mode. - NEW - #5897 - FillOffForRaster=1 can be used to disable polygon fills when a raster backdrop is drawn. - NEW - #5898 - The Force Black and White Print Option will now disable all fills. With style-based symbologies now being more common than instance-based symbologies, the Style Manager’s usage in GTViewer has increased significantly in the last few years. As I have told users before, the Style Manager is a complicated beast, but even with its many quirks and nuances, life is much better with it than without it. Now, with one button click, the Style Manager is opened, the Category id and Filter Id are set from the Element Tab's info, and any assigned Style Mapping and Definition are selected. By default, this option is turned off because it is probably not very useful (and somewhat distracting) to the ordinary user. However, if you are setting or tweaking a few or a lot of styles, this option is a great time saver. GTViewer version 8.0.1.43 is available. GTViewer version 8.0.x.41 is available. - NEW - #5829 - The Style Origin defined in Standard Fonts for Text Element symbols was not used in Rotation and Scaling operations. - NEW - #5831 - ToolBox actions can now be a list of commands. - NEW - #5832 - LoadStyleMap and LoadStyleDef methods have been added to the Document object. - NEW - #5833 - ToolBox Actions now support BGColor to allow the background color to be changed. - NEW - #5834 - ToolBox Actions now support StyleMap and StyleDef to allow the current Style Map or Definition to be changed. - NEW - #5835 - DisplayToggle command can now be specified with the shorter DispTog in a ToolBox action. - NEW - #5836 - DispOn and DispOff have been added as ToolBox commands to turn on or off the specified items. - FIX - #5837 - Toolbox #5 was not closing with document or moving with the main application. Related to #5808. - NEW - #5838 - ToolBoxEntry lines can now be greater than 255 characters when making extract files (.gtx). - FIX - #5839 - Problem on fresh installation if a GTM file is opened, then closed, but OpenLastFile is set. Running GTViewer again would give a file invalid message. - NEW - #5840 - The token followed by a tokenized URL is now supported by the Link Base Location property which indicates that the file attribute File value will replace a token () in a URL string. The token is also supported to specify equal signs (=) in the URL. - NEW - #5826 - Scale attribute added to the DGN Export parameter file. - NEW - #5827 - Export as DGN will now convert multi-line text string to multiple text element entries. - NEW - #5828 - Export as DGN will now use justification attributes when placing text elements. - NEW - #5820 - Updates to the Attribute Info functional to better supported Linked Document from GT/Field. - NEW - #5821 - GTViewer will now filter the "table." out of a GT/Field Attribute name if the table is the same as the record's name. - NEW - #5825 - FontMap entries int the ExportDgn configuration file now support non-stroked text and symbols. - NEW - #5812 - GetCategoryList method added to Document object. - FIX - #5815 - Export to DGN was transposing the font and justification value for Text Node elements. 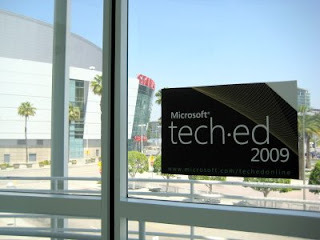 This year the TechEd Developers Conference was merged with the TechEd IT conference and happened last week in Los Angeles. While there were significantly fewer Developer oriented sessions, it was interesting to sit in some of the IT sessions. With around 700 sessions to choose from and only about 20 you can actually attend, the need to be particular about what you want to learn becomes very important. I heavily weighted my track with “Mobile”, but I also checked out SQL Server’s Spatial capabilities, and the future directions of the development environments and programming languages. The push, I mean focus, this year was definitely the yet to be released Windows 7 and Windows Server 2008 R2, followed by a healthy dose of Virtualization in the form of Hyper-V and Windows Virtual PC. I did have an opportunity to run GTViewer on a beta copy of Windows 7 at the “Bring Your Own App Lab.” There were a few glitchy things with reading some values out of the registry, but overall I was very pleased with how well GTViewer worked the first time on Windows 7. I have already checked off a lot of grief on my to-do list from this experience. The free booze they were passing out was not even necessary to favorably color my opinion of Windows 7. The focus last year was definitely LINQ, which seems to have been toned down now to is actual value. WPF and Silverlight, looked cool to try, but now they look usable. Microsoft’s creation of tools to help spawn the development of new programming languages is supposed to bring about an explosion in new languages. I along with everyone else in the Polyglot Programmer session cringed at the idea of having to learn dozens of new languages, but like LINQ, this idea may fade into a manageable and productive tool in our programming arsenal. I was hoping to see Windows Workflow (WF) be a hotter topic than it apparently is, but it may take a few iterations before it catches on. I was pretty pleased with TechEd 2009. I will continue to process the information for a while. GTViewer version 8.0.x.37 is available. - CHG - #5792 - Feature Tooltip display time increased to 30 seconds. - CHG - #5805 - The maximum number of prompts with QueryInitialize was changed from 10 to 50. - NEW - #5806 - LocateXY added as a Toolbox Command. - CHG - #5807 - Default position for Toolbox moved down to be under the toolbars. - FIX - #5808 - Problem with the 5th Toolbox being defined. - NEW - #5809 - ActivateCapture2PointLine method has been added. - NEW - #5810 - The GTViewer.dll .NET Assembly is now delivered. Version 8.0.x.10 of GTVx is available. - CHG - #5793 - Feature Tooltip display time increased to 30 seconds. - NEW - #5794 - PrintBorder Print property has been added. - NEW - #5798 - token is now supported in Print notes. - FIX - #5799 - Problems with Print Labels. - NEW - #5800 - New Print Properties: ShowPrintableArea, PrintPaddingLeft, PrintPaddingRight, PrintPaddingTop, PrintPaddingBottom. - CHG - #5801 - Changes to the Print View scaling mechanism to work better when no border or labels are wanted. - NEW - #5802 - New Print Property: PrintViewRange. GTViewer version 8.0.x.36 is available. - FIX - #5791 - Toolbar persistence caused problem when opening a file. - NEW - #5788 - Toolbox settings can now be persistent between sessions. - NEW - #5789 - Toolbox entries now supports a DisplayToggle command. Congratulations to SECO Energy for winning an Excellence Award at GITA 2009. Steve Dingman presenting "Field Collection of Joint Use and Area Light Data at SECO Energy"
Version 8.0.x.9 of GTVx is available. - FIX - #5630 - Emphasize Session Graphics mode was causing filled elements to be too dark obscuring other features. - FIX - #5634 - Overview Window did not use Style Information if the Overview style was not specified. - FIX - #5639 - Problem with counting functionality having a linear with a point on the count polygon. A zero length segment could have been added to the detail list. - NEW - #5641 - UseLocateZoomAsMinimum entry has been added to Additional Properties to force Thematic Queries to use the query specified locate zoom as a minimum zoom level. - NEW - #5642 - Added DefaultLocateSingleFind, DefaultMaximizeInitialView, DefaultMouseWheelIncrement, DefaultOpenLastFile, DefaultShowElementTab, DefaultFeatureTooltips, have been added to the Additional Properties section. - NEW - #5643 - The EmphasizeSessionGraphicsColor entry is not supported in the [Additional Properties] section. It was previously only supported with GetDataProperty and SetDataProperty. - NEW - #5657 - IsPointInShape method will not check the element's point list to see if it forms a closed shape (such as a linestring). - FIX - #5661 - Emphasize Mode and Highlight were drawing Mask characters in Layered symbols. - FIX - #5673 - GetViewExtents did not return the correct values when using mode 1 and 11. - FIX - #5678 - Export to DGN had a problem with shapes containing more than 5000 points. - FIX - #5683 - Highlighting elements where some had weight overrides and some did not would cause any highlighted feature after one that that had its weight overridden to be treated as if it did have its weight overridden. - FIX - #5691 - Feature Count highlight sometimes did not use the correct weight for the highlighted segments. - CHG - #5694 - Default Stroke Angle for Circle Element (105) rendering has been lowered to 5 degrees. - CHG - #5695 - All Stroking angles for Ellipse, Circle, and Arc elements have been lowered to 5 degrees. - CHG - #5703 - Element that are not clipped by the Feature Counting are not highlighted as the original element (instead of the segments) so that converting Highlighted Elements to Session graphics will preserve the original element. - NEW - #5704 - Support for Shape with Hole element in the Feature Counting to match that in GTViewer. - NEW - #5705 - Linkage Info is not included on elements partially Highlighted by the Feature Count functionality. - FIX - #5709 - Fixed Scale text and symbols did not appear the same size on the screen and prints. - FIX - #5720 - If the VirtMap entry in a .gtm is changed to a relative path, the Links entries using relative paths did not work because their relative paths was based on the VirtMap entry. - NEW - #5721 - If the DM Tooltip Separator is set to an empty string, there will be no separator added between DM tooltips when multiple tooltips are present at one location. - NEW - #5725 - Data Properties added to retrieve the number of each element type exported with the ExportSessionGraphicsAsShp: ShpPointCount, ShpLineCount, ShpPolygonCount. - FIX - #5755 - Elements using UDLS style with alternate colors defined would show up in color when the Force Black and White was used with Printing. - FIX - #5770 - ExtendedTextStyle 6 was not working because text element ranges were not using style and zoom level information in their computation. - FIX - #5772 - Fixed Scale with Mode 6 Extended Text Style did not scale correctly when printing. - NEW - #5786 - RotateSelectedElements and ScaleSelectedElements have been added. - NEW - #5787 - ScaleElement was added as a counterpart to RotateElement. - NEW - #5585 - UpdateElementSetText method has been added along with the 2048 update code for UpdateElement. - NEW - #5605 - ElementClipboardCopy, ElementClipboardCut, ElementClipboardPaste, ElementClipboardReset, and ElementClipboardCount added. ElementClipboardCountChanged event added. - FIX - #5606 - SelectElement and UnselectElement were not firing the ElementSelected event. GTViewer version 8.0.1.34 is available. - NEW - #5778 - Applications menu added. - NEW - #5779 - GetTextOrSymbolRectangle method was added to View object. - FIX - #5771 - Fixed Scale with Mode 6 Extended Text Style did not scale correctly when printing. - NEW - #5774 - ActivateDrawSelect mode has been added to the App object. - FIX - #5775 - Element Selected Message (204) was not being sent. - CHG - #5776 - GetCapturedPointList has been changed to filter out duplicate points. GT/Field Pro version 8.0.0.51 is now available. the values only if a default value was used. the values if the feature is saved. default value correctly from the string. specifies a sequence of value. - NEW - #5765 - The "LastPlusOne:" token has been added to the Default Value string to specifies that the default value will be the last value plus 1. - FIX - #5766 - Emphasize Mode did not work for Printing. - NEW - #5738 - GPS Status messages were added. - FIX - #5741 - Absolute Paths were not being correctly handled in a .GTM file. - FIX - #5569 - Query Form did not support hidden prompts. - FIX - #5706 - Post would always say no Post Actions defined. - NEW - #5736 - Upgraded GPS Component Library. Border color with Shape with Hole elements. Version 1.0.0.28 of the GT/Metadata Explorer is available. be compared to a String set to 'NULL' Previously, a NULL String variable would be a blank (""). versions are now displayed in the status box. - FIX - #5669 - Save Settings was not saving if it were not already present. - NEW - #5602 - Site License support. expressions to be invalid when passed to Oracle. The PGTViewer .NET Control for Window Mobile version 8.0.0.5 is available. - FIX - #5584 - GPS Interval event were being set to seconds instead of miliseconds. - FIX - #5632 - Emphasize Session Graphics mode was causing filled elements to be too dark obscuring other features. - FIX - #5750 - Processing of Satellite Information changed to prevent possible errors. GTViewer version 8.0.1.32 is available. - FIX - #5751 - Clipping Problems with Shape with Hole element have been fixed. Probably only seen when printing large Shape with hole elements that are filled and mostly out of the view. - FIX - #5754 - Elements using UDLS style with alternate colors defined would show up in color when the Force Black and White was used with Printing. - FIX - #5756 - The ActivateCaptureLineMode would keep the reference point as part of the line when the right mouse click was used to finish the line. - CHG - #5757 - Change to ActivateCaptureCircleMode so that the initial point does not fire the 603 event. - FIX - #5758 - Soft button panel did not display for ActivateCaptureLineMode. - CHG - #5759 - Indicator point has been added to ActivateCaptureAreaMode. - CHG - #5760 - CapturePointWithConfirmation mode will now accept the right mouse click as a Finish (like the Line and Area capture modes). - NEW - #5761 - Message 208 has been added to indicate that a new session graphics element has been drawn (interactive). - NEW - #5762 - Message 209 has been added to indicate that a new feature was placed as a result of a vertex edit. - NEW - #5763 - Message 210 has been added to indicate that interactively drawn element will be immediately drawn. The PreWriteData, PreWriteKey1, and PreWriteKey2 data properties have also be added. GTViewer version 8.0.x.31 is available. - FIX - #5727 - If ActivateCaptureLineMode used 0 as the Max Points parameters, then it would incorrectly terminate the line after the first point. - FIX - #5728 - If ActivateCaptureLineMode used a value less than 0 for the MaxPoints parameter, the capture would not work. - CHG - #5729 - The Right Mouse Finish is now supported with ActivateCaptureLineMode as it is with ActivateCaptureAreaMode. - CHG - #5730 - The ActivateCaptureLineMode will always show the reference point now when no points have been added. - FIX - #5731 - DrawGroupStart, DrawCircle32, DrawText32, DrawLineString32, and DrawLine32 were using the current color instead of the Active Color (set by the drop down). - FIX - #5732 - Problem with Combo Box color being used correctly. - NEW - #5733 - CustCoordConversion entry added to Additional Properties section. - FIX - #5734 - Custom Attribute Info did not release its memory when data closed. - NEW - #5745 - GTFieldPostAction can now be set to 3 to clear all session graphics. The GTViewer .NET Control for Windows version 8.0.0.19 is Available. - FIX - #5722 - If the VirtMap entry in a .gtm is changed to a relative path, the Links entries using relative paths did not work because their relative paths was based on the VirtMap entry. - NEW - #5739 - GpsNmeaSentence event has been added. - FIX - #5740 - Absolute Paths were not being correctly handled in a .GTM file. - FIX - #5743 - Processing of Satellite Information changed to prevent possible errors. - FIX - #5713 - Problem introduced with the unfinished Link support that prevented attribute information from properly being returned. - FIX - #5700 - Maximum Number of Priority Elements has been removed (inherited from the device version of the control, but not needed for the desktop version). - FIX - #5631 - Emphasize Session Graphics mode was causing filled elements to be too dark obscuring other features. - FIX - #5583 - GPS Interval events were being set to seconds instead of milliseconds. 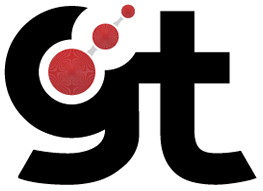 With Version 8.0 of GTViewer, GTI's Logos and Corporate Image have been upgraded. 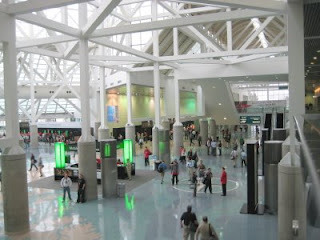 The photo above shows our booth at DistribuTECH 2009 in San Diego. GTViewer version 8.0.x.30 is available. - CHG - #5714 - Element Count display on status bar has been changed to show displayed elements instead of cached elements. This change allows better tuning of display filters. - FIX - #5715 - Problem introduced with #5701 that prevented the Count Highlighted elements for getting linear elements. - NEW - #5716 - CopyPasteMode added to Additional Properties so that selected elements are unselected when data is copied. - FIX - #5718 - If the VirtMap entry in a .gtm is changed to a relative path, the Links entries using relative paths did not work because their relative paths was based on the VirtMap entry. - NEW - #5719 - If the DM Tooltip Separator is set to an empty string, there will be no separator added between DM tooltips when multiple tooltips are present at one location. - NEW - #5723 - UDLS Flag=4 has been added to support centering symbols in the middle of a line versus mode 3's centering a symbol within each segment of a line. GTViewer version 8.0.1.29 is available. - CHG - #5701 - Element that are not clipped by the Feature Counting are not highlighted as the original element (instead of the segments) so that converting Highlighted Elements to Session graphics will preserve the original element. - FIX - #5702 - After Highlighted elements are converted to Session Graphics, a RefreshView is now performed to flush the element cache. - NEW - #5707 - Custom Attribute Info definition supported. - FIX - #5708 - Fixed Scale text and symbols did not appear the same size on the screen and prints. - NEW - #5710 - LoadSupplimentalFile added to Additional Properties section to add the contents of a file to the Additional Properties section. - FIX - #5711 - Embedded Styles did not carry over to .GTS Session files. - NEW - #5689 - The GetCaptureCircleInfo and SetCaptureCircleInfo methods have been added. - FIX - #5690 - Feature Count highlight sometimes did not use the correct weight for the highlighted segments. - CHG - #5692 - All Stroking angles for Ellipse, Circle, and Arc elements have been lowered to 5 degrees. - CHG - #5693 - Default Stroke Angle for Circle Element (105) rendering has been lowered to 5 degrees. - NEW - #5696 - BGMaskClear and BGMaskAddCircle methods have been added. - NEW - #5697 - GetGisInfoFromFilterId method has been added. - NEW - #5698 - CountFeatureDetail method has been added. - NEW - #5674 - ActivateCaptureLine method added. - NEW - #5675 - GetCapturedPointEx method added. - NEW - #5676 - Message 603 has been added to indicate when a point has been captured. - FIX - #5677 - Export to DGN had a problem with shapes containing more than 5000 points. - FIX - #5679 - GIS Feature Attribute label was not displaying. Problem with #5646. - NEW - #5680 - Source Feature Name and Source Style Name items have been added to Element tab to suppor the GIS1: entry in the Filter File description field. GIS Feature and GIS Component have been renamed to Source Feature and Source Component. - NEW - #5681 - AppId property can now be defined on External Application enties (ActiveX and DotNET). - FIX - #5682 - Highlighting elements where some had weight overrides and some did not would cause any highlighted feature after one that that had its weight overridden to be treated as if it did have its weight overridden. - FIX - #5684 - Open File button on the Extract dialog would fail openning file if there were spaces in the filename. - NEW - #5688 - ActivateCaptureCircleMode added. GTViewer version 8.0.1.26 is available. - FIX - #5672 - GetViewExtents did not return the correct values when using mode 1. - NEW - #5670 - Point in Polygon will now stitch together groups of lines and/or linestring elements and see if they make a shape when testing elements. - NEW - #5666 - Print and Magnify support added to the Dynamic Highlight Functionality. - FIX - #5667 - Dynamic Highlight was not drawing Priority deferred elements. - NEW - #5668 - Exposed Feature Count functionality to the Automation layer. - NEW - #5658 - The GetFilterIdFromGisInfo method has been added to return a list of Filter ids from a GIS Feature and GIS Component information stored in the Filter Description field. - FIX - #5659 - Emphasize Mode and Highlight were drawing Mask characters in Layered symbols. - NEW - #5660 - The Locate Latitude/Longitude query will now interprest the N, S, E, W prefixes. - NEW - #5662 - Info button added to Query Results dialog. - NEW - #5664 - Dynamic Highlighting functionality now supports Weight as well as style in the mapping. - NEW - #5665 - Dynamic Highlight now supports a default and view level Display Flag, Min Thresh, and Max Thresh. - FIX - #5652 - On Vista, the closing point with the Capture Area mode would sometimes have a 0 for the X value. - FIX - #5653 - Capture Area mode will now automatically filter any repeated points. - NEW - #5654 - The FillOffForRaster entry has been added to the Additional Properties section so that element fill will automatically be turned off when raster is shown. - FIX - #5655 - For Ratio scale mode with printing, the scale label was using minor and major unit lables. - NEW - #5649 - Dynamic Highlight Functionality added. reviewing elements without filters defined. - NEW - #5651 - Message 602 has been added and will be sent when the Capture Area mode is cancelled. - NEW - #5617 - Additional Alternate Color tables. - NEW - #5618 - Color Table Names now supported. - NEW - #5644 - ActivateCaptureAreaMode and GetCapturedPointList have been added. Messages 601 has been added to indicate that an Area has been captured. - NEW - #5645 - Apply button has been added to the Color Table dialog. - NEW - #5646 - GIS Feature and GIS Component information are now read from the Filter Description field. This information is shown on the element tab of the Attribute Info dialog. - NEW - #5647 - StyleDisplayThreshold, WeightDisplayThreshold, PriorityDisplayThreshold, StylePrintThreshold, WeightPrintThreshold, PriorityPrintThreshsold have been added to the Category section so that individual style, weight, and priority threshold control can be specified by Category. These entries will override the corresponding entries in the General Info section (which will be the category defaults otherwise). - FIX - #5648 - The Force Black and White Print Option will now disable all fills.